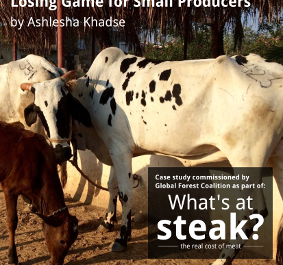 This case study prepared by Ashelsha Khadse was part of a report What’s at Steak, published by Global Forest Coalition at the 13th Conference of the Parties to the Convention on Biological Diversity, held in Cancun, Mexico from 4-17 December 2017. Despite India’s booming success in cooperative models of production, especially the dairy cooperative movement that turned it from a milk deficient country to the world’s highest milk producer, there is a growing push towards free trade, privatization and hyper competitiveness. Such a race to the bottom is changing production models towards more resource-intensive, high-yielding styles of production, and the majority of our farmers—comprising mostly landless, marginal to small ones—are finding it increasingly hard to maintain and keep milch animals as they have traditionally done. Government data indicates that the number of bovine holdings has steadily decreased over the years from 230 million in 2002–2003 to 204 million in 2012–2013, with cows decreasing more than buffaloes (12.33% versus 9.21%). Bovine is more concentrated in the medium to large categories of farmers, while chicken and pigs in the small to landless categories. Chicken populations have increased dramatically by more than 1.4 times from 182 million (2002–2003) to 255 million (2012–2013). This is due to the rise in commercial poultry farming (NSSO, 2014). Indian farmers have customarily integrated livestock into their farming; crop residues fed animals, and the animals in turn provided manure, milk and meat. This has been a low input system. Indian livestock was never one that was bred on concentrated grain feed in factory farms, as is the norm in industrial farming. Beef Statewide percentages for vegetarian versus nonvegetarian consumers. Trends point to increasing meat consumption—70% of Indians now consume meat. (Source: (Bose 2016) [based on Government of India survey, 2014]) production in India (mainly carabeef/buffalo meat) has been fairly ecologically sustainable, only existing as a byproduct of the dairy sector, fed on crop residues and not relying on concentrated grain feed, or deforested tracts of land for grazing. Farmers only sell male buffaloes or spent females. Cows are generally not eaten by Hindus due to religious reverence, but commonly consumed by other minorities like Muslims, Christians or Dalit communities. Recently, there has been a wave of fanaticism by upper caste Hindu’s around cow eating, and various groups have been subjected to violence by the so-called right wing ‘gaurakshaks’ (cow protectors) (Moore, 2016). Some states have banned cow slaughter, however a few like Kerala allow them. Many illegal slaughterhouses abound. Male calves and especially old bulls are either abandoned or sold to slaughterhouses where, along with spent cows, they are processed for leather, meat or for the rennet in their stomachs that is used for cheese making (MacDonald and Iyer, 2012). The beef export sector is thriving. India is the world’s largest exporter of beef (mainly carabeef) which is primarily from animals culled from the dairy sector (Landes et al., 2016). However, with an increasing push to grow cash crops, livestock rearing has been disconnected from farming. Now farmers need to buy expensive fodder for their animals. A heavy promotion of exotic, high-yielding breeds by the government has led to reliance on high inputs and aftercare, medication and water, all with detrimental consequences on their livelihoods and the environment. Traditional pastoralist communities are completely under threat—their grazing/common lands have disappeared, and they are forced to ‘settle’, fenced out of areas that traditionally belonged to them, many shifting to other occupations. Grazing areas surrounding forests too have been blocked by the forest bureaucracy, which instead promotes plantations in such areas (Bhaduri, 2013). 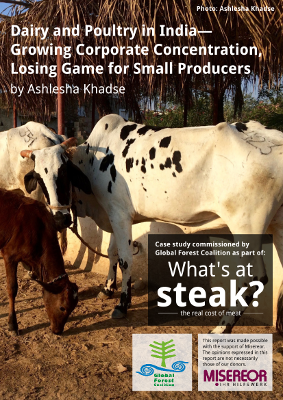 This brief report provides an overview of the key challenges affecting two fast transforming areas of the livestock sector in India—dairy and poultry. These are two sectors that are moving towards production models that are not sustainable or desirable given the ecological crisis and widespread hunger and livelihood loss ongoing both globally and in India. These are also areas that have great potential to provide sustainable livelihoods and nutrition security to millions. The urgency to put them under a spotlight and imagine alternatives is great.